The 2018 European Railway Award has been presented to the Gotthard Base Tunnel Project, for delivering the world’s longest railway tunnel, shifting freight to rail. 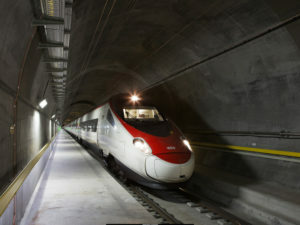 Peter Jedelhauser, former Head of the Gotthard North South Corridor Project at SBB, and Renzo Simoni, former CEO of AlpTransit Gotthard Ltd accepted the award on behalf of the European workforce who brought the project to life. This is the eleventh edition of the European Railway Award, where, since 2007, the European rail sector has celebrated and recognised the political and technical contributions of accomplished individuals to the sector. The ceremony, which took place at the Square Meeting Centre in Brussels, was followed by the joint CER-UNIFE Annual Reception and attracted more than 500 guests from all over Europe, including high-level politicians and transport stakeholders. The award was accompanied by a donation of €10,000 to the charity of the laureate’s choice. Peter Jedelhauser gave his prize money to Stiftung Personalfonds SBB, and Renzo Simoni gave his to ARGO (Foundation for integration of people with disabilities). Original press release © European Railway Award.